What is the Mission of the BSL Hall of Fame? 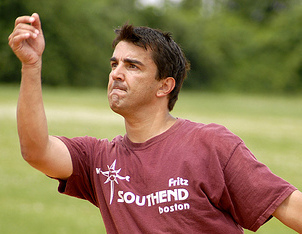 The mission of the BSL Hall of Fame is to provide a historic perspective on and to perpetuate the history of organized gay softball in Boston which began in 1978. 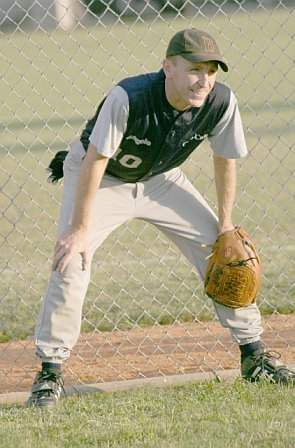 The Hall of Fame, formed in 2005, seeks to recognize those who have given that extra effort and exhibited great sportsmanship in addition to achievements of athleticism and dedication. The Hall Of Fame is as much interested in the future as in the past of the BSL. The Hall Of Fame hopes and believes that recognizing the efforts, contributions, and achievements of its members will inspire all members of the BSL to display similar qualities and give that extra effort. The Hall of Fame is an organized part of the BSL that hopes to strengthen the League by perpetuating its history, honoring its present, and serving as a foundation for its future within our community in Boston. What is the BSL Hall of Fame Committee? The Hall Of Fame "Committee" includes all living Hall Of Fame members in addition to one administrator. 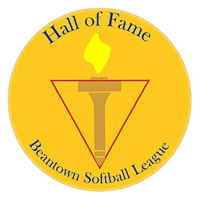 The Hall Of Fame Committee is charged with the responsibility of promoting the nominations of new and worthy candidates for election and induction into the Beantown Softball Hall Of Fame. The committee reviews the criteria and credentials of each candidate presented to it. Upon review- the Committee votes, by anonymous ballot, on these candidates. The Committee then organizes and promotes the Induction Ceremony Event. When the new members are inducted, they become part of the Hall Of Fame Committee. This membership entitles them to vote for all future candidates and enables them to contribute to the goals and activities that the Hall Of Fame may choose for its future. How can someone be nominated and inducted into the BSL Hall of Fame? What are the rules for election into the Hall of Fame? The members of the BSL Hall of Fame Committee, which includes all living Hall of Fame members, will vote on the nominees each year. The nominees who receive a two thirds majority of the votes cast are inducted. Any 10 year member of the BSL, whether living or deceased, can be nominated. 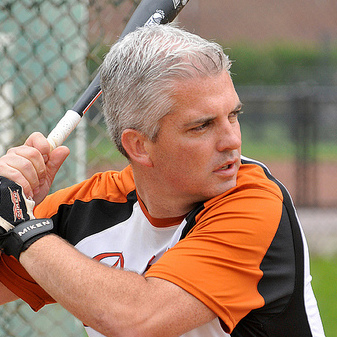 The nominee should have made a significant contribution to the BSL (as a player, coach, sponsor, league officer, non player, donor, friend of the BSL, etc.). All nominations will be considered on a case by case basis. BSL members who have been inducted into the NAGAAA Hall of Fame, through a BSL nomination, are automatically inducted into the BSL Hall of Fame. Is there a special ceremony for those inducted? The BSL Hall of Fame Committee holds a Hall of Fame Induction Event each year to recognize those who have been elected into the BSL Hall of Fame. The committee plans the event on the third Saturday of June, during the softball season, following the BSL game schedule in an effort to accommodate ALL BSL members who choose to attend. Is there a Display honoring the Hall of Fame Members? The BSL Hall of Fame Committee placed the official Hall Of Fame display in the foyer of Club Café at 209 Columbus Avenue in Boston. The HOF Committee intended for the display to be simple and dignified. An expanded, electronic display can be found at the Hall OF Fame website: www.bslhalloffame.com. Does the BSL Hall of Fame have a Budget? The BSL Hall of Fame has a simple budget. Funds are required to cover the costs of such things as the Induction events, website maintenance, administrative related costs, display construction, archival preservation, and award/recognition items. The Hall of Fame has a functioning "Boosters Club" which accepts donations from Hall of Fame members and anyone who wishes to support the HOF. The committee also suggests admission donations from those who attend the Induction Ceremony in June. The BSL Hall of Fame has been self-sustaining since its inception. The Committee continues to investigate and implement means to raise funds for itself through such means as corporate sponsorship, and other options displayed on the Hall of Fame website under "support the Hall Of Fame" at www.bslhalloffame.com. Can I assist the BSL Hall of Fame Committee? 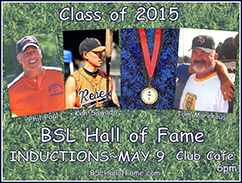 You are encouraged to get involved with the BSL Hall of Fame Committee by contacting us at info@bslhalloffame.com. The committee is seeking diversified assistance by those who can share relevant League experience, professional experience and historic perspectives. The committee specifically seeks help with events planning, publicity, fundraising/ financing and website administration. Can the Hall Of Fame use any of the Memorabilia I have saved over the years ? The Hall Of Fame is seeking any significant historic items from previous BSL seasons or events such as newsletters, photos, slides, movies, recordings, annual award recipient information, annual final standings, event programs, signs, pins, newspaper articles, etc.... The committee would like to display these items on its website, in its display case as well as at league games, events, playoffs, banquets, etc. You can donate or lend your memorabilia to the Hall Of Fame. How do I contact the BSL Hall Of Fame? To contact us, email: info@bslhalloffame.com or call: 781-820-8110.